Swimming–heated pool with lifeguard on duty. Two hours of pool time is included with your overnight stay (Memorial Day - Labor Day). 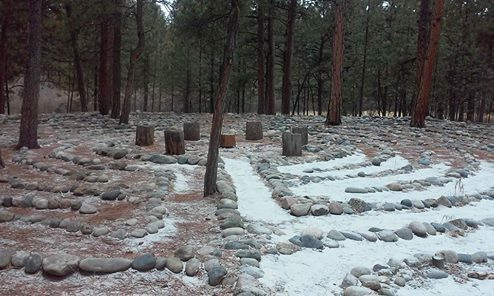 Labyrinth–an 85 foot diameter, walking meditation path. Learn about the history of the labyrinth by downloading a brochure here. Games–tennis, basketball, sand volleyball, GaGa Ball, horseshoes, two softball fields and a large open meadow for endless field games. Hiking–several scenic trails wind throughout La Foret's 350 acres. Visit the Meditation Trail and see if you can find the sacred Ute Prayer Trees. La Foret boasts some of the oldest and largest Ponderosa Pine trees in the Black Forest. The Thomas trail, one mile long, winds through the south end of our property. Campfire Circles–three designated areas for campfire sing-a-longs and smores! Firewood and fire starter are all provided free of charge. Hayrides–sit back and enjoy the beauty of La Foret by taking a group hayride. Schedule with the office up to two weeks before your retreat. Archery–Our newest recreational activity. With two weeks advance notice, Archery may be added to your retreat for a minimal fee. Please contact the office for more information. Ropes Course–one of Colorado's finest! A powerful tool for team building and personal growth including a zipline, power pole, low elements and an orienteering course. Two-hour, four-hour and custom programs are available. * Call today for more information. 719-495-2743. *Team Building is not purely a recreational program. Individuals are asked to move outside of their comfort zone by using different elements. Some of the elements are physically and emotionally challenging and may not be suitable for everyone. Questions about what the program involves can be answered by the Ropes Course Facilitator anytime prior to the activity.